Zounds! Outdoor Shakespeare Abounds Near Puget Sound! I’m updating this post for 2019! At this point, not all of the dates for 2019 for outdoor Shakespeare productions that I know of are in. You can navigate to the bottom of this post for events currently on our calendar. The featured image for this post is from the Folger Shakespeare Library— did you know that they released a ton of images with a share-alike license. The collection is fascinating to browse and another way to lose yourself online. This article contains some affiliate links. That means if you click on a link that is an affiliate link, and then make a subsequent purchase, I get a small commission which helps me support this blog (and justify it to the powers-that-be). Sigh no more! Summer is coming. I love being outdoors, and I love theater, so one of the many things I’m looking forward to this summer is attending some outdoor Shakespeare performances. In 2018, I saw Seattle Shakespeare‘s (indoor) performance of Shakespeare in Love at the Cornish playhouse. Sadly, “Romeo and Ethel the Pirate’s Daughter” shall remain one of Shakespeare’s um…lost…plays, but outdoor performances of his published plays abound in our area, including that of Ethel’s lesser cousin, “Romeo and Juliet”. And many of them are, blessedly, free. Seeing Shakespeare performed outdoors seems, somehow, right. Performances for most troupes are during July and August to catch the good weather though, around here, we never quite know what to expect. Remember to pack your own seating and some extra layers for evening performances. I especially love the mid afternoon performances on a sunny day — a perfect time to pack your festival blanket and a picnic. Put money in thy purse (but if you enjoy the show, consider a donation to the theater company). If you donate at the Outdoor Theater Festival, Seattle Shakespeare might make you an official groundling. GreenStage, Wooden O and other local theater groups sponsor The Seattle Outdoor Theater Festival at Volunteer Park in July. Performances are from various theater groups from the very small to the professional Seattle Shakespeare Company. It’s a great free event — even people who don’t generally like Shakespeare (like my spouse) may enjoy this event — pack a picnic and bring your (low) festival chairs or blankets as seating is on the lawn. In 2018, David Pichette’s performance as King Lear was stunning and made my husband conjecture that The Bard must have been a bit crazy himself. Pre-show music before Edmonds City Park production of Much Ado About Nothing back in 2010. Greenstage is Seattle’s Shakespeare in the Park company. Productions are mostly held around the Seattle area — they used to hold a production or two at Battle Point Park on Bainbridge Island in the past but I’d guess that either productions weren’t well attended or coming over to our side of the pond on the ferry was too problematic. 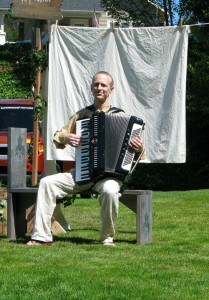 Wooden O is the summer outdoor Shakespeare branch of Seattle Shakespeare Company. Productions are in parks ranging from Seattle north to Lynnwood and Edmonds, on the Eastside and south to Tacoma. As one would expect from Seattle Shakespeare, productions are very professional. The Island Shakespeare Festival is held in Langley on Whidbey Island; performances are pay what you will. In 2019, they’ll be putting on A Midsummer Night’s Dream and The Winter’s Tale as well as an adaptation of Dante’s Inferno. Specific performance times haven’t yet been announced as of this writing but performances are generally held Thursday through Sunday at 6 PM. Last Leaf puts on one hour versions of two plays every year; perfect for kids or those of us adults with attention spans to short to sit through full length productions. In 2019 their productions will be As You Like it and Henry VIII. Productions are usually in Woodinville, Lake Stevens, Monroe, Arlington, and Bellevue. The Key City Public Theatre in Port Townsend puts on an indoor Shakespeare play in August and then does outdoor performances of it in Chetzemoka Park. In 2019, the play will be The Merry Wives of Windsor. The cost is “as you like it” (by suggested donation) at the gate, while you can purchase tickets on the website for their indoor productions. However, every year in July, Bainbridge Performing Arts puts on an outdoor Shakespeare production at beautiful Bloedel Reserve. This year’s production is As You Like it and runs from July 11-28. Tickets to on sale on Brown Paper Tickets tickets on June 1 and range from $10.00 for students to $35.00 for families. The season runs July 13 – August 18, but specific dates are not yet listed at the time of this writing. These are events that we know of so far. If you know of an event that should be here that’s not on our calendar, you can add it here. Shakespeare’s most famous story of love at first sight where two young people taught to hate each other risk everything to be together. Shakespeare’s great comedy of love lost and found in a land where passions overtake reason and nobody is quite what they seem. Every July Bainbridge Performing arts presents outdoor Shakespeare at Bloedel Reserve. This year's production is As You Like It. Free theater festival (of course, donations are always appreciated) held annually at Volunteer Park. Shakespeare and more. Cheryl wants to say she is an Occupational Therapist turned freelance writer and web designer, but, in truth what she does mostly does, aside from other responsibilities is write this blog with a bit of freelance writing and web design thrown in on the side. She loves to travel and does so whenever possible, but will likely never no nomadic because she lives in the beautiful PNW which she has not nearly explored enough.She also loves drinking coffee, reading, studying French, and is trying to get back into fitness for cycling and kayaking. She recently purchased a rooftop tent which she is excited about using more this summer. She usually does not write about herself in third person. I’d love to hear from you...leave a comment. Get crunchy email goodness from the PNW delivered to your inbox. I send newsletters and site updates on an irregular basis. You can opt out at any time. Keep up to date on the Blog. Currently emails are sent on an irregular basis and contain both travel and PNW content. You can unsubscribe at any time from the footer of any email we send. Or go to the Disclosures Page. I send crunchy PNW and Travel goodness to your email box on an irregular basis. Email newsletters are non-spammy and any email newsletter I send will contain an unsubscribe link in the footer in case you should ever no longer want to hear from me.